uuid : 107067eb-aa4b-4f35-a275-bcb4da6c5dcc templates_id: 119568 templates_uuid: "7a583541-9354-4c40-8775-3ac52aeb5d89" title: "Free Prenuptial (Prenup) Agreement Template Online" display_name: "Prenuptial agreement (prenup)" meta_keywords: "Prenuptial agreement" description: "
If you and your future spouse or civil partner have assets which each of you would like to own as individuals rather than jointly, record these assets in a prenuptial agreement. This will ensure that any assets, be it property, cash or heirlooms owned prior to marriage or civil partnership will be owned by the individual and not jointly. This premarital or pre-civil agreement covers situations where both parties have taken independent legal advice or where both have made a considered decision not to. A prenuptial agreement (prenup) is used where two parties wish to set out what will happen to their premarital or pre-civil partnership assets in the event of a divorce or dissolution. If you intend to get married or enter into a civil partnership and want to keep previously acquired assets, such as property separate then you can record this in a prenup. Can I use a prenup if forming a civil partnership? Yes - This document can be used for both marriages and civil partnerships. Prenuptial agreements are not currently legally binding in England and Wales, but in most cases the court will be persuaded to uphold a prenuptial agreement provided it has been properly drawn up and executed. What steps should we take before signing a prenup? It is recommended that both of you seek independent legal advice and prepare full disclosure of your respective financial positions before signing a prenuptial agreement. You must think carefully about the terms and make the agreement as precise, clear and detailed as possible. If you feel you need further advice before signing a prenuptial agreement, Ask a lawyer. What should I include in description of assets? In the description of assets you must disclose all of your previously acquired assets and you must not withhold any valuable possessions or goods. If you don\'t, the agreement may be invalid. What about assets acquired after marriage/civil partnership? Any assets acquired after marriage or civil partnership will be divided by agreement or judicial determination should there be breakdown of marriage or civil partnership. In the description of assets you must disclose all of your previously acquired assets and you must not withhold any valuable possessions or goods. If you don't, the agreement may be invalid. More than just a Prenuptial agreement (prenup) template, our step-by-step interview and guidance makes it easy to create your document. Easily create online, download, print and sign your free Prenuptial agreement (prenup) in minutes. 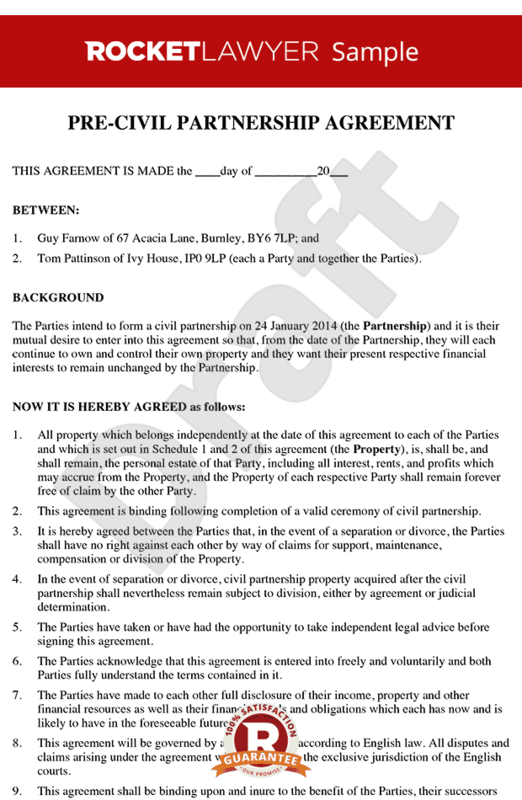 This document is also sometimes called: Prenuptial agreement.